Don’t you just love it when you take a chance on a film you wouldn’t normally choose to watch and it turns out to be bloody brilliant!! With a small but talented cast, compelling story and an unexpected twist this is definitely one to check out. Its more of a thriller than horror, there is a bit of violence and blood but for what little that is shown it makes up for in having an incredible realism to it. 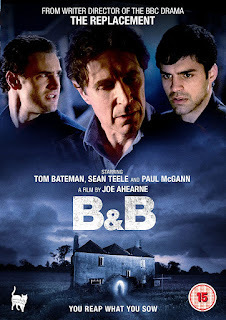 To touch briefly on the story, gay couple Marc (Tom Bateman- Da Vinci’s Demons) and Fred (Sean Teale- Skins) return to a Christian run B&B in London a year after taking the owner Josh (Paul McGann- Doctor Who, Withnail & I) to court for not allowing them the same right to a double bed as a heterosexual couple. Now married, Marc and Fred decide to rub Josh’s face in it by returning to demand the same wish as before. The case was largely publicised so Fred is worried this may evoke the rage of homophobes in the area and lead them to a bashing, knowing that Josh will probably do very little to aide them in an escape. Josh’s son, Paul (Callum Woodhouse- The Durrells) doesn’t help matters by no longer being able to hide who he is, harbouring a lot of family issues and confiding in Fred. Touching on secretive homosexual late night liaisons of those that wish their sexuality to remain hidden this deals with the issues in a sensitive way. It’s immersive, fast paced and really well done in everyway. Great performances from the entire cast who are fantastic in their roles, Callum Woodhouse is a little wooden at first but when you get to know his character you warm to him a lot more. All the elements fit well together to create a thoroughly enjoyable film, I won’t harp on about it a longer, and if you get the chance you should definitely see it.